Lee Jae-yong arriving at the court in Seoul ahead of his sentencing. AFP picture. BBC. A court in South Korea has sentenced Samsung’s billionaire heir-apparent Lee Jae-yong to five years in prison for corruption. Lee was convicted of bribery in a scandal that also saw the impeachment of South Korea’s former president. The case has gripped the public amid growing anger against South Korea’s biggest companies known as chaebols. Lee who denied all charges had faced a jail sentence of up to 12 years. Also known as Jay Y Lee, the de facto head of the world’s largest smartphone maker had been detained since February on a string of corruption charges. These included bribery, embezzlement and hiding assets overseas. The 49-year-old is accused of giving donations worth $36 million to non-profit foundations operated by Choi Soon-sil, a friend of South Korea’s former President Park Geun-hye, in return for political favours. Prosecutors said the donations were made to Park’s confidante to win government support for a big restructuring of Samsung that would strengthen Lee’s control over Samsung Electronics. But Lee’s defence team said that the payments were signed off without his knowledge. Lee has previously admitted that the firm also gave a horse and money to help the equestrian career of Choi’s daughter, Chung Yoo-ra, but denied seeking favours. His lawyer said on Friday they would appeal against the court’s decision. “We are confident the ruling will be overturned,” Song Wu-cheol said. The case contributed to Park’s eventual impeachment and she now faces trial for corruption herself, something she denies. If convicted, she faces life sentence. Her friend Choi has already been jailed for three years after being found guilty of using her position of influence to solicit favours for her daughter. 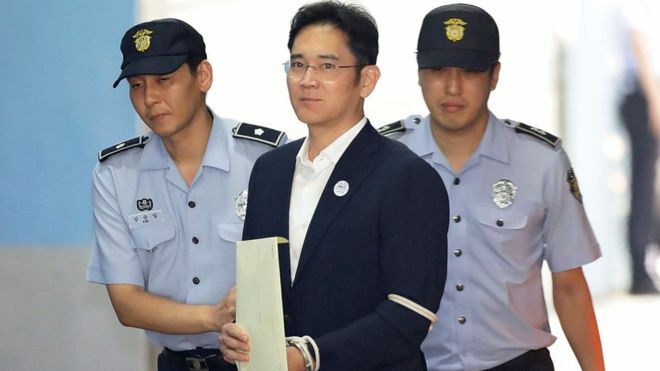 On Friday, two other Samsung executives, Choi Gee-sung and Chang Choong-ki, were also convicted in the same trial as Lee and sentenced to four years in prison. Former Samsung Electronics president Park Sang-jin and executive vice-president Hwang Sung-soo were handed suspended sentences. This isn’t the first time a top executive of a big conglomerate has been convicted for corruption in South Korea. But in the past, they’ve either been given suspended sentences or have been pardoned by the president. The new president, Moon Jae-in, has already said there will be no more presidential pardons. So if Lee’s sentence is upheld by higher courts and he ends up serving his complete sentence in jail or a significant part of it, that will be a departure from what we’ve seen in South Korea in the past. And the new government says that will be a strong message to chaebols that they need to clean up the way they do business. The conviction represents a huge blow to South Korea’s biggest and most well-known business empire. Since the verdict, Samsung shares fell by 1%. It also raises questions about the future leadership of the family-run conglomerate. Lee has been standing in as chairman since his father, Lee Kun-hee, suffered a heart attack in 2014. Lee has two sisters, who are in management roles in different parts of the Samsung group, but it is unclear whether they could be brought in to higher positions. Since Lee’s arrest six months ago, the group’s business operations have continued largely unaffected. Samsung Electronics posted a record profit of 11 trillion won for the latest quarter and the firm has released its new flagship Galaxy S8 smartphone, closing the book on the disastrous recall of the exploding Galaxy Note 7. The chaebol includes a shipbuilding division, a construction company, and pharmaceuticals and advertising arms. The word chaebol is a combination of the Korean words for clan and wealth. It is the name given to South Korea’s massive family-run business empires that wield huge influence in the country. They normally own numerous international enterprises. Other examples include LG, Lotte and Hyundai.